There's actually nothing that hard about marketing as long as you're willing to stop copying everyone else. But, for some reason, that's what many people find most difficult. Which is good news for me, if somewhat baffling. While I sometimes feel that my specialist subject is the blindingly obvious, I've come to accept that many people don't see it that way. At least until I've pointed it out. Then they have trouble believing it can be that simple. You'll get a feel for my approach as you wander around this site. It won't be for everyone, but if you're up for doing things differently then you can start enjoying the feeling when your competitors are copying you - and getting it wrong. ...even though it really isn't that complicated. 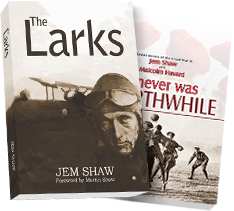 If you're looking for books and short stories by Jem Shaw, then you'll find them in their own sub-site by clicking below.